Alert escalation involves a fundamental layout of potential events and problems, and the range of actions required for fixing them. These multiple-condition checks can be set up to ensure that actions requiring the least resources are attempted before progressing to more elaborate ones. Notifications can be sent as per a predefined order of hierarchy, so as to avoid multiple alerts that could overwhelm personnel. For instance, your network monitoring software can issue alerts starting from a support tech, then proceed to support tech plus a junior administrator; and so on in a widening circle, in the event the problem escalates. The integrated Alert Center in WhatsUp Gold offers alert escalation features through its notification policies and alert acknowledgments. 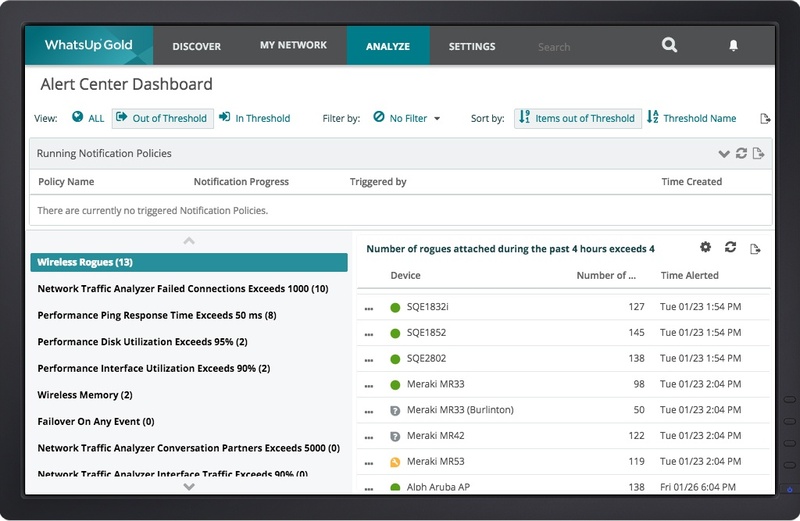 The notification policies in the Alert Center can be configured to escalate alerts based on the criticality of the network components – the alerts can move up from automatic trouble ticket generation to sending out alerts to pre-designated administrators. With the Alert Acknowledgement feature, the first responder’s acknowledgment is considered an indication the issue is being addressed, and no further alerts are sent, unless triggered by the notification policy or as log messages after the issue has been resolved. This ensures that the issues are not fixed within the timeframe are addressed appropriately. Likewise, information about the action taken can be added to the acknowledgment process, thereby providing problem resolution data that can be used in the event the issue reoccurs.